I’ve taken up my transcription project again and have some excerpts to share. 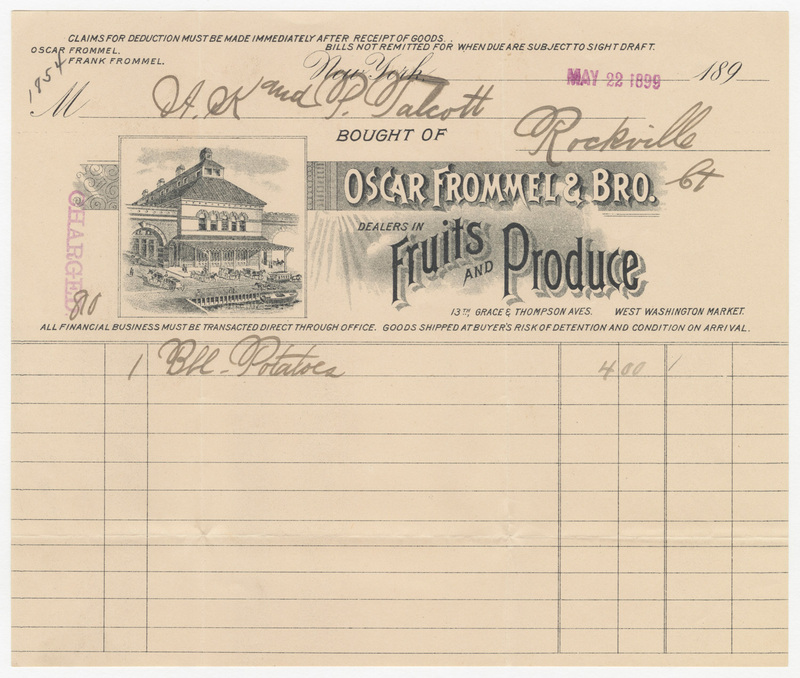 Context for the first entry: Emma’s husband Frank worked for Oscar Frommel & Bro., a produce dealer based out of New York. He traveled by train all over New England, and appeared to have oversight responsibilities over the transport of apples, pears, etc. In the entries preceding this one, Emma expressed some concern that Frank had not yet arrived home from New Haven. Monday, January 20, 1890 Rainy and foggy. Frank came in the night. He hired a man to bring him from Palmer. He left New Haven on the night express train expecting to get off in Springfield, but he went to sleep and got carried over nearly to Worcester before the conductor woke him up, then he had to pay his fare and get off. He had .10 left and over a hundred dollar in checks and his r.r. pass book but those did not do much for him in a strange place, so as soon as daylight he started out to see how far he could walk in a day. He arrived in Palmer in the evening, then drove the rest of the way. Mr. Haywood and Frank slept until nearly noon, then they had dinner and Mr. H. started on his way back again. I basted an apron for Susie and cut out a dress for Mother W. Grandpa walked home from the village this P.M.
Emma and Mattie went to school. Mrs. Cooper is having fiery trials with Mrs. Wheeler. Everyone has about all they can stand up under, of some kind or another. “Grit and Grace” need to be in bountiful supply. The distance between Worcester and Palmer is over 30 miles according to my quick Google search. Long walk. Ruby appears to have been born prematurely – based on the weight and Mrs. Graves’ surprise at being called so soon. I am going to assume that Mrs. Graves was a midwife. Does anyone know what services she would have provided since she was not present at the delivery itself? The late 19th century was apparently a transition time, as doctors began to more widely practice obstetrics and midwives’ role in the general population began to decrease. Emma doesn’t appear to be a fan of Dr. Perry’s bedside manner though. 2010. Spiegel & Grau. ebook. 322 pages. 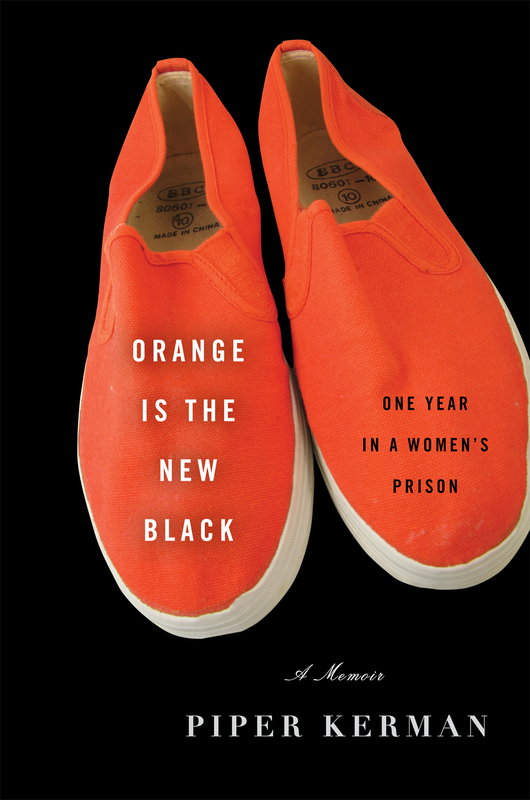 In case you haven’t heard of this book before, Orange is the New Black is Piper Kerman’s memoir about her experience in a women’s mininum security prison in Danbury, Connecticut. It inspired the Netflix TV show by the same name, of which I have watched both seasons. In 1993, Kerman helped transport drug money for her girlfriend at the time. In 1998, she pled guilty to the crime, but didn’t serve her sentence until 2004. KERMAN: [A] small kindness from a prison officer, or a staffer, can sometimes really mean the world. There were also a very, very small number of folks – men, in my experience – who really made it their business to make life miserable for prisoners. And one prison guard can make hundreds and hundreds of prisoners’ lives unbearable. GROSS: There’s a lot of times when you’re frisked, when you’re in prison. And for one of the guards, that’s an opportunity to feel women up – one of the male guards. Is that something you experienced in prison, or is that something that was written for the Netflix series? KERMAN: I – like, I think most of the women that I knew in Danbury frequently experienced, you know, that really simple and straightforward groping, which is a total violation. It’s really low-level sexual abuse, but it is really persistent and pervasive. And so that would happen all the time and generally, that would happen in the course of going in or out of the visiting room. So it’s particularly jarring to sort of have that kind of a violation happen just as you’re about to go and try and have a really positive experience with your loved ones. Kerman’s critique of the prison system should not lead to the conclusion that Kerman denies her own culpability in her situation. Kerman states from the start that her jail-time was deserved: she broke the law and received the consequences of that action. She is also aware of her own privilege – that she had a supportive fiance, plus supportive family and friends throughout her jail-time, and that her sentence was relatively short. Also, as friendly as fellow inmates could be, prison should in no way be construed as some sort of summer camp. Kerman makes it clear that prison is emotionally punishing and the lack of freedom is not an abstract concept but something deeply felt on a daily basis. The boredom, the lack of privacy, the separation from family and friends, from the world and its beauty, are all part of the experience. Do the prisoners come out of their sentences prepared to re-enter the world? Kerman’s opinion is that they largely do not. She also specifically criticizes mandatory drug sentences, which have led to more, and more lengthy incarcerations than seems beneficial to society. There are a couple other prison or prison-related memoirs out there that I may read, now that I’ve read the most currently famous one. I’d particularly like to read Ted Conover’s Newjack: Guarding Sing Sing, about how Conover, a journalist, applies to become a prison officer. 2005. Scribner. Paperback. 288 pages. 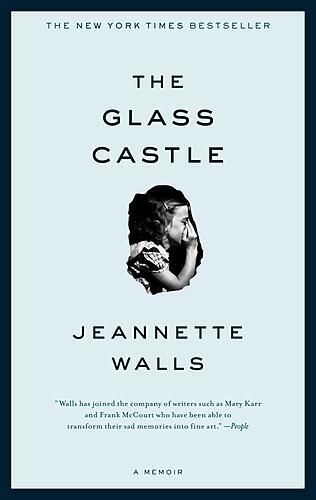 I first read The Glass Castle five years ago and absolutely loved it. I had no trepidation when I picked it up again. I knew it would hold up to a re-read and it did. I like that Walls’ tone throughout the book manages to be matter-of-fact without distancing the reader. My emotions were always engaged, but not manipulated, by her writing. Also, the narrative she constructs for her childhood is very compelling. The book memorably begins with Jeannette Walls as an adult, taking a taxi to a party in New York City, and then she looks out the window to see her mom digging through a dumpster. The book soon transitions to an early memory of how Jeannette was badly burned while trying to boil a hotdog at three years old. She captures a child’s journey from accepting her parents as normal to the slow realization that something is wrong. In one of these turning points, Jeannette and her sister Lori have just finished off eating margarine with sugar, for lack of other food options. Mom got angry. She was saving it, she said, to butter the bread. We already ate all the bread, I said. Mom said she was thinking of baking some bread if a neighbor would loan us some flour. I pointed out that the gas company had turned off our gas. “Well,” Mom said. “We should have saved the margarine just in case the gas gets turned back on. Miracles happen, you know.” It was because of my and Lori’s selfishness, she said, that if we had any bread, we’d have to eat it without butter. Mom gave me a startled look. I’d broken one of our unspoken rules: We were always supposed to pretend our life was one long and incredibly fun adventure. Another reason I love this book is the bond between Jeannette and her siblings, who look out for each other, in the face of their parents failure to do the same. I recently read two thought-provoking reviews/comment sections around this book that I want to discuss a bit. Both reviewers admire the book, but as I interpreted from their writing, they experienced some unease regarding the book’s reception by readers – that is, how readers categorized the story, and what they took away from it. The fairy tale critic, Jack Zipes maintains that fairy tales are as much for the parents as the children, a way of making them feel better about the stuff they may have done to their kids. And that’s the part of the book I struggle with – the thought of all the people who might read this and think: see, what I did wasn’t so bad after all. The concern here, I think, is that the Hansel and Gretel aspect of the story, and Walls’ dispassionate tone may cause readers to gloss over the parental wrongs, and reinforce this idea that children can magically surmount anything if they just have enough guts and determination. Here is a link to Litlove’s 2009 review from her blog, Tales from the Reading Room. She and those who discussed the book in that review’s comment section expressed unease about people who see the book as uplifting, who praise the author’s forgiveness and indeed, see it as a story about forgiveness. This criticism of readers made me feel a little defensive, at first, as what stays with me about this book is how the siblings helped each other out of their situation. So yes, a big part of the reason I like the book is this one positive aspect to her story, in the midst of the harrowing details. I may not use the word uplifting, but I found myself rooting for these kids and feeling glad when three out of the four of them managed to free themselves from the situation. In a funny way, the expressed unease of some commenters on Litlove’s blog made me feel uneasy, because it sometimes came across as: “Dear other readers: you’re reading it wrong.” But at the same time, I must admit that I have expressed similar unease when it comes to the popularity of books like Twilight. And I think the key here is the popularity of the work, because it is then that we start wondering why is this popular and we start connecting it to patterns of popular stories. One of the commenters on Litlove’s review remarked how Americans love the “pulling ourselves up by our bootstraps” narrative. If this narrative is overly favored, such favor may submerge narratives which describe the damaging generational cycle of poverty and abuse. Thus, The Glass Castle‘s popularity makes some readers uneasy, because it can be seen as inadvertently contributing to this imbalance. Of course, such favor isn’t the fault of the book itself, especially in this case where it is a memoir describing actual life events. And I feel that I can love what I love about The Glass Castle without caveat, while acknowledging that it shouldn’t be the only type of narrative I read about poverty. And it hasn’t been: I’ve also read books like Adrian LeBlanc’s Random Family, a nonfiction book that captures the cycle of poverty among families in the Bronx. That said, I definitely welcome more suggestions for books about poverty, especially nonfiction and memoir. Thanks to Jenny, Litlove and sundry commenters for stirring me to deeper thought on this topic, and I hope I haven’t mischaracterized your opinions! Unfortunately, I think that bridge-builders like Armstrong often face contempt as they try to create understanding and dialogue in places where partisanship is the norm. So I want to express my appreciation for writers who, in my opinion, are trying to foster havens of respectful dialogue among disparate groups, and within controversial topics. Due to my own personal interests and train of thought right now, the bridge-building authors I have in mind all have written about Christianity. Matthew Vines, Justin Lee, and James Brownson have each published books which work toward reforming conservative Christianity’s stance on homosexuality. I’ve read Matthew Vines’ book God and the Gay Christian and Justin Lee’s memoir, Torn. I hope to read Brownson’s more densely academic book, Bible, Gender, Sexuality in its entirety this year (I’ve read portions) and also would like to read David Gushee‘s Changing Our Mind after hearing him deliver a speech at last year’s Reformation Project conference in D.C. The speech was called, “Ending the Teaching of Contempt against the Church’s Sexual Minorities.” I haven’t reviewed Vines’ or Lee’s book yet, as I’m hoping to finish Brownson’s book and write a comprehensive review of all three, plus Jeff Chu‘s fantastic book Does Jesus Really Love Me? With all of these authors, I see their goal of reform as also a goal of building bridges, as many in Vines and Lee’s situation have understandably left the faith and never looked back, but these two and others have decided to remain and keep the channels of dialogue open. Are bridge-building authors important to you as a reader? If so, who are the bridge-building writers you admire? What topics are they interested in? 2010. Penguin. ebook. 581 pages. Scholar Diana Bishop is a witch who largely refuses to use her powers – except for special occasions, such as when her washing machine is broken or a book is out of reach. While conducting research in Oxford’s Bodliean Library, Diana comes across a spell-bound book and has a brief magical interaction with it before returning it to the stacks. This action brings her to the attention of all the supernatural creatures in the vicinity: the other witches, daemons, and vampires. One vampire in particular, Matthew Clairmont, seeks her out and the two fall in love. This taboo relationship and Diana’s burgeoning powers throw both of them into danger, as they journey to Clairmont’s ancestral home in France and then to Diana’s home in upstate New York. 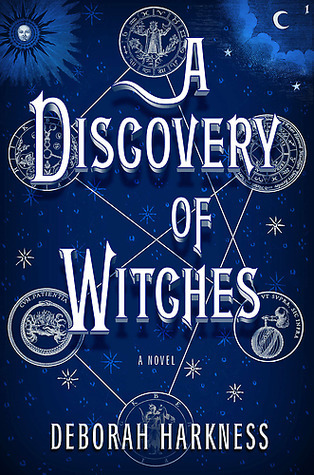 If I were to compare A Discovery of Witches to another book, it would be Elizabeth Kostova’s The Historian. The two books share a combination of vampires, history and travel, not to mention lengthiness. I remember loving Kostova’s novel, especially her ability to evoke the way places were in certain times. A Discovery of Witches does not have as good a sense of place, except for Harkness’ depiction of the old haunted house in upstate New York. I loved that house with all its quirks and ghosts. Harkness gave the upstate New York locale a New England feel, and I certainly warmed to that. Indeed, the last third may have been my favorite part of the book, as more and more characters show up at the house, including one of my favorite side characters, Miriam. True, the last third also could get boggy as supernatural politics and rules are stuffed in alongside eleventh-hour hurried explanations – [**Spoiler**] oh Diana you have all the powers because you absorbed your twin in utero! okay go time travel now! [**/end spoiler**]. Why am I starting this review by describing the last third? Well, I wanted to start with the positive, I guess. I debated giving up on this book while in the first two-thirds because I hated the Matthew / Diana dynamic so much. Young “special” woman courted by very old vampire? Oh, and he’s stalkerish (“over-protective”), handsome and rich too? Yippee. The first part – in Oxford – was almost insufferable, as Matthew shows off his antiques and fine wines to Diana, whisking her around in his high-end car and to his high-end estate. And he’s also – wait for it – dangerous, so there’s that tired rigmarole as well. The section in France is a little improved, as we are introduced to Matthew’s mom, Ysabeau, also a cool side character. But it’s also: more antiques! More displays of Matthew’s fine tastes! And it was in this section that I realized that the book features lots of scenes of Diana being told to rest. Usually this is for a good reason, as she experiences a lot of emotional and physical trauma during the book. But she is constantly submitting to the caretaking and ministrations of others, and this gets repetitive. As lengthy as this book is, as a reader, you start to eye those repetitive aspects and ask if all that was really necessary. I’m semi-curious about the rest of the trilogy, as I did like aspects of the book. Despite the clumsy way it was sometimes handled or written, the supernatural politics and world-building had some intrigue. And the side characters had promise – more airtime for them could possibly benefit the story as a whole, I think. Has anyone read the whole trilogy? Does it get better? 2003. Knopf. Hardcover. 336 pages. Two years ago, I read Karen Armstrong’s Twelve Steps to a Compassionate Life as part of an interfaith book discussion. Although I’m aware of Armstrong’s impressive bibliography of books on the major world religions, I have not yet read any of them. Twelve Steps was recently published and is kind of the book incarnation of Armstrong’s work toward a global compassion movement. The Spiral Staircase is Armstrong’s memoir that starts from her departure from the convent to the time of the memoir’s writing (it was published in 2003). 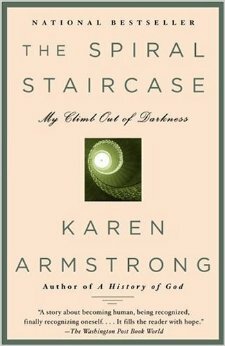 There also exists a memoir about her time in the convent called Through the Narrow Gate, and I was surprised to learn from The Spiral Staircase, that Armstrong had published a memoir about her post-convent life before, in 1983, under the title Beginning the World. She seems to disavow the 1983 version of her story now. The title of the book is a reference to T.S. Eliot’s poem, “Ash Wednesday”. The first part of the poem prefaces The Spiral Staircase: “Because I do not hope to turn again / Because I do not hope / Because I do not hope to turn . . .” The poem and the title evoke a gradual climb that doesn’t always feel like progress. For those who, like me, didn’t read her first memoir, Through the Narrow Gate, Armstrong provides enough background to understand how life in the convent damaged her. The Spiral Staircase begins with Armstrong as a student in Oxford, unable to emotionally connect to art and slowly giving up on God, whose presence had always eluded her. She has a formidable intellect, but still struggles to find her place in academia. Disappointment after disappointment seem to dog her life, though friends and her landlord’s family provide bright spots that pierce through her internal darkness. Armstrong’s voice in The Spiral Staircase is very frank but also generous toward her past self and toward others. One of the most heartbreaking aspects to Armstrong’s story is her long-undiagnosed epilepsy. During her life in the convent, Armstrong experienced several attacks that looked like fainting to others’ eyes. Her superiors accused her of being dramatic. Outside of the convent, her episodes – which often included hallucinations, disorientation, terror and sometimes amnesia – became even more frightening. Psychiatrists thought it was mental illness and addressed it accordingly, and of course this failed to actually help her. When she was finally diagnosed, the doctor expressed exasperation at how all these psychiatrists failed to recognize her textbook case of epilepsy. Even today, Armstrong writes, there are some people in her life who refuse to accept that her epilepsy is a medical problem, not a mental illness. Faith was really the cultivation of a conviction that life had some ultimate meaning and value, despite the tragic evidence to the contrary. The Spiral Staircase was a difficult read at first, because her life was difficult then, but I think that is necessary in order to feel the joy as Karen finds her place in the world. I’m glad to have read this memoir before diving into her backlist, as I think it will add to the reading experience to know how she came to be interested in writing about the world religions. 2009. GRAPHIX. Paperback. 214 pages. Review: This delightful graphic novel is a coming-of-age memoir aimed at a young-adult audience, but definitely enjoyable for adults. 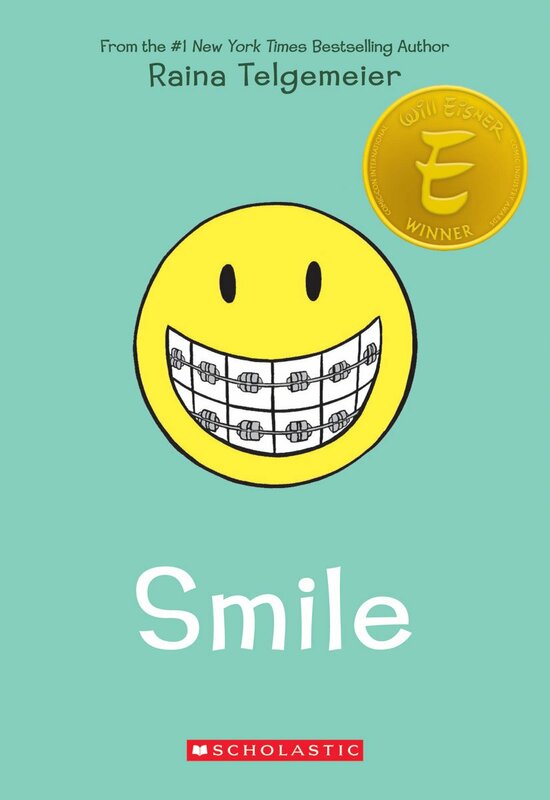 Raina Telgemeier depicts the story of her junior-high and high school years, which start inauspiciously with an accident that damages her two front teeth. Various dental surgeries and procedures become the throughline for her tale of teenaged life. The specifics of Telgemeier’s life touch on common, recognizable ground: the crushes, the frenemies, the discovered interests. My teenaged life was about a decade later than Raina’s, and was even more devoid of boys than hers, but oh, I definitely identified with the fear of embarrassment and being a teenaged observer to a natural disaster (hers a devastating earthquake, mine a much-less-devastating, but still powerful ice-storm). My absolutely favorite part of Smile was when Raina switches from one group of friends to a new group of friends: Telgemeier takes a moment to acknowledge that the old friends didn’t transform into sworn enemies, but rather morphed into friendly acquaintances. 2013. Bantam. ebook. 336 pages. Review: This is the second book I’ve read by historical romance author Cecilia Grant, and the third in a series (I read the first in the series.) In this book, Kate Westbrook is intent on improving her family’s lot by reconnecting with her father’s estranged family and marrying well. Family friend Nick Blackshear was once in love with Kate, but now has other things on his mind, principally the negative effect his brother’s marriage has had on his law career. I appreciate how Grant’s world shows the consequences of “unacceptable” marriages (as decided by society) and that there is no magic resolution for some situations. I like how Kate and Nick are flawed but likable, and that the story isn’t only about their developing relationship, but also about their relationships with their family and friends. The historical backdrop is much more smoothly integrated in A Woman Entangled than it was in Grant’s good, but sometimes dragging, A Lady Awakened. I would recommend this for fans of Courtney Milan. They do not have exactly the same style, but some of the same sensibilities. 2013. William Morrow. ebook. 246 pages. 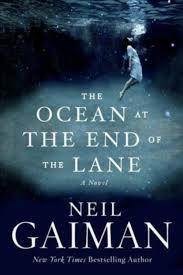 Review: I don’t love Neil Gaiman’s books. I’ve read two others besides this one: Neverwhere which I disliked, and Stardust which I liked but didn’t leave much of an impression. I added myself to the library’s waitlist for this ebook because The Ocean at the End of the Lane had been near omnipresent for a while on my blog feed. It’s a fairly simple tale, with some interesting fantasy details. But as I’m writing this, I’m kind of wondering what else to say. I mean, the book is not without some quietly powerful moments, such as when the main character – a young boy – stands up to his father. And everything about the farm is warmly inviting. I liked the bittersweet tone of the book overall. But it’s just not a very memorable book for me.